Please call 1-877-542-5687 to reserve your campsite for 2019! Camping at Wagon Wheel Ridge home of Kick’n Up Kountry is a great way to be a part of the festival. No need to drive and the sites are really close to the music so you can enjoy the show without all the walking at some festivals. All camping is reserved. You can purchase Backwoods camping with electrical or Backwoods general camping with no hook-ups. 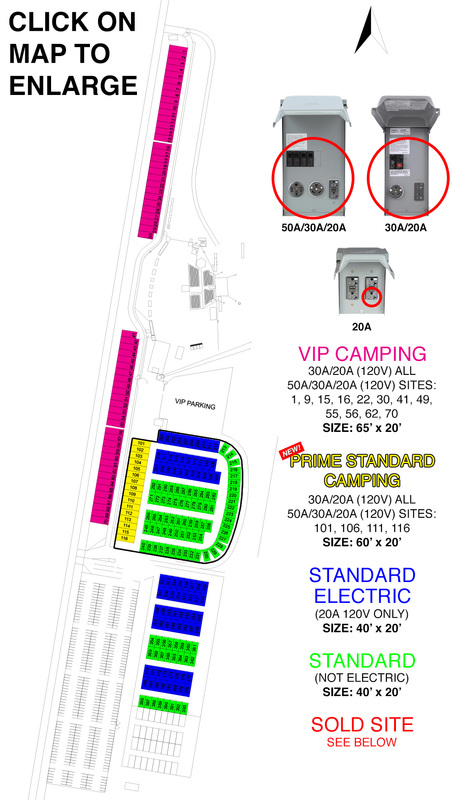 VIP camping is included with the purchase of your Deluxe VIP Ticket packages and features Water and Electrical Hookups. All campers have access to the shower house and bathrooms. Everyone who stays overnight at the Wagon Wheel Ridge campground must have a music ticket and a camping wristband. One camping wristband is included with the purchase of your drive to camping site. All campers must have a camping wristband and a festival music ticket. Purchase one camping wristband and one festival music ticket per person. A vehicle permit must be purchased to reserve each campsite. Every vehicle entering the campground MUST have this permit. If you do not purchase a permit you do not have a campsite reserved. Everyone entering campgrounds must purchase a wristband/camping pass; however, one pass is included with the purchase of a campsite/vehicle pass. Firearms are not allowed on the festival property WITH or WITHOUT a permit. No weapons of any kind. No illegal substances of any kind. No ATV’s, golf carts, boats or powered scooters–Only Kick’n Up Kountry authorized vehicles and staff are allowed to enter with such vehicles. No cruising on motorcycles or any vehicles inside the campgrounds. No one under the age of 21 can consume alcohol anywhere on the Kick’n Up Kountry grounds. No large amount of beer or kegs of beer in camping area. No live music in campgrounds or any type of attraction that would contribute in drawing a crowd. No supplying or selling any alcoholic beverages. No soliciting of any kind. Please make sure your site is clean before leaving the campgrounds. Those who have difficulty walking will be provided with golf cart shuttles. All vehicles must fit on your campsite. Everyone in the campgrounds MUST have a festival wristband. There is a noise curfew of 2:00A.M. in the Reserved section and 2:30A.M. in the General section. Extreme noise is never allowed in any campground at any time. Those who want to camp together should arrive together. Campsites cannot be saved for late arrivals. Generators MUST be shut off by 2:00 A.M.
Every motorized vehicle entering the campground is required to have a pass. You must purchase an “Extra Vehicle Pass” for any and all non-camping vehicles parked at your campsite. For your safety, all vehicles MUST fit on your campsite. If your vehicles do not fit safely, you will be required to purchase an additional campsite. Kick’n Up Kountry is NOT responsible for any tickets, goods or property that is stolen, lost or misplaced. Kick’n Up Kountry is NOT responsible for any personal injuries. Individuals who engage in illegal, violent, or unruly behavior anywhere on the festival property, will immediately be dismissed from the grounds.